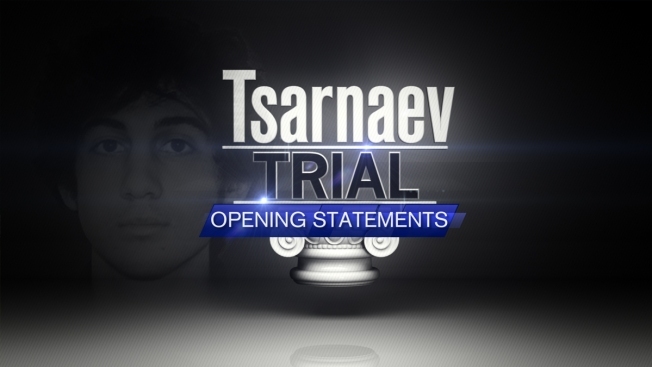 Who Are the Tsarnaev Jurors? A jury has been seated in the trial of Boston Marathon bombing suspect Dzhokhar Tsarnaev. The panel of 12 jurors and six alternates was chosen Tuesday; opening statements are scheduled for Wednesday. 21-year-old Tsarnaev faces 30 charges in connection with twin bombings at the finish line of the Boston Marathon on April 15, 2013. He could face the death penalty, if convicted. Three people were killed, and more than 260 were injured. An MIT officer was also killed in a shootout following the bombings. Works for the Mass. Dept. of Energy Resources, Gas and Electricity, since 1987. Would be honored to be eligible to serve, he said in questionnaire, adding Tuesday, for any case. Attended fundraiser for Marathon Bombing victims, and donated $50 or $75. Asked about death penalty, he cites cruel and unusual standard, but says he doesn't know how to apply it. Says in this case he's open to life or death sentences based on evidence. Currently a senior executive assistant. She has a friend who worked as a correctional officer, now in HR for sheriff. She says she has other friends who work for jail systems. Served on two prior juries. Most recently an alternate in April 2014 drunk driving case. Also served on civil jury years ago. She says she'd have an open mind on the death penalty adding, "I'd have to hear the circumstances and the evidence." Student whose financial aid fell through, unemployed. Was working at Best Buy for holiday season. Was studying psych and neuroscience. Uses Facebook. Nothing personal. Tries to avoid political things. Mother native of Iran, former Muslim. Came to U.S. in 1978. Knows a little bit of Farsi. Watches BBC and Al Jazeera occasionally. Not sure about death penalty. Thinks the death penalty is valid. Thinks it would be merciful if you believe in an afterlife. Would also consider life sentence. RN, Good Samaritan Medical Center, Brockton. Planned cross country trip in April with boyfriend. No opinion on death penalty. The only thing that she says she can definitely remember from that time, after the fact, is when they showed the finish line. Didn't know name of defendant until summoned to court. Water department worker in a city near Boston. Would wait to hear evidence before making decision. Was at work Marathon Monday. Watched events on TV. Husband is a financial advisor. She runs events. Had been a social worker, volunteers for domestic violence haven / service/ support group. Friend is a Homeland Security lawyer, immigration. Unsure about guilt or death penalty. Restaurant manager supervising about 50 workers. Works about 20 miles outside city, says unaffected by bombing. Got high-fives wearing Boston Strong shirt. Could vote for death penalty. Designs women's clothing for start-up firm. Told court she began job in December. Believes the defendant is guilty, but is unsure about penalty. "I think that there’s involvement. I watched the shootout in Watertown on TV," she says. She also says she bought a T-shirt from "Life Is Good." She says she could be impartial. Legal executive assistant for managing director of corporation. Uses Facebook sometimes; doesn't know how to post. Believes defendant guilty. Unsure about death penalty. Auditor, fired in January for productivity. Trying to collect unemployment, happy to serve on jury. This juror uses Facebook to see what's going on. Unsure about guilt, would need to see more evidence. Says neutral on death penalty. Went to UMass Lowell. Lived in Woburn at time of bombing, had girlfriend in Stoneham. Works at Mass General. Telecommunications engineer with Partners Health Care. Upgrading 30,000 phones. Worked the day of bombing. On 14th floor by main entrance. Uses social media daily. Previously worked for travel company. Would need to see evidence before deciding guilt or innocence. Recalling day of bombing: You could feel something in the air. You could feel a buzz. Something happened. Single parent. Has 3 children at home. Twin boys in 8th grade. Girl a senior in high school who drives. Believes defendant guilty, unsure about penalty. Says she could be impartial. Works for school system. Says there were no victim events at her school. Her ex-husband's cousin ran marathon. She was in Texas on vacation with kids during marathon. Their return flight delayed. Bought a Boston Strong T-shirt for nephew, a cross-country runner. Retired from telecommunications industry. Also worked as a salesman and bus driver. Unsure about guilt or innocence. Hasn't seen any evidence. Says he is open to death penalty or life sentence. Air traffic controller on Cape Cod. Otis Air National Guard, Falmouth. Says he is skeptical of media. Believes he can be impartial. Open to death penalty. Digital sales for Barnes & Noble. Peabody, MA, North Shore Mall. Says she's unsure about guilt or penalty. Cousins have Boston Strong materials, but she doesn't. Watched a concert on TV. Personally against death penalty, but would follow the law. Not entirely sure she could vote for death penalty. Paints houses, works alone. Says wife is the breadwinner. Unsure about guilt. Believes wife might have donated to victim fund. Wonders whether innocent people have been sent to death. Feels conflicted. Could be persuaded. Retired actuary, property and casualty, Price Waterhouse. Husband, retired public school music teacher. Husband's cousin killed on 9/11, WTC. Unsure about guilt and death penalty. She would expect prosecutors to prove their case. Thinks life in prison worse than death. Supervisor, Department of Developmental Services. "We try to teach people everyday living skills."